Leiden astronomer Xander Tielens has been awarded a Spinoza prize, the highest scientific prize in the Netherlands. 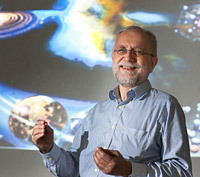 Tielens is Professor in the Physics and Chemistry of Interstellar Space. He studies large and complex, often organic, molecules found in interstellar space. The Spinoza prize carries a cash award of 2.5 million euro.